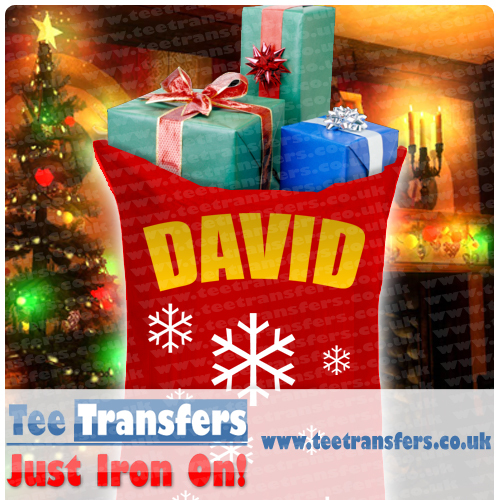 David here, just going to run through a very quick tutorial on how to make a great personalised Santa sack using our easy to apply iron on heat transfers available from our shop. 1 x Pillow Case (We find red works the best!) - Primark have these in stock! 1 x Flat Hard Surface! Why use a pillow case? Pillow cases are great because they are made usually from Cotton, are soft and can be washed. Our transfers will go onto most pillowcases fine, and they double up as a Santa Sack! A lot of the market bought Santa sacks are a felt type material which will eventually hole and to be honest look somewhat tacky in their appearance. Once you have ordered your transfers they will usually arrive within 24-48 hours weekdays. Make use of the transfer builder where you can just type your name / letters and click order - its that simple! A flat pillow case will allow you iron on your transfers easier. If your using a heat press, this is really easy, just press it for a few seconds at around 140 degrees and your ready to rock and roll! I chose my name in Gold (purely for festive purposes). I cut each of the letters up into individual characters and spaced them as shown below. Using the instructions provided i ironed on each letter in an arch which looked pretty centre - top to the pillow case. And there you have it, a make your own Personalised Santa Sack, using nothing more than some cheap transfers and a pillow case. Here's some ideas to make your sack even better! David has been a Good boy this year! Please Fill my Santa Sack with loads of Presents! My Santa Sack is only happy when its full! Give it a whirl, and send in your pictures to: info@teetransfers.co.uk and we'll feature them on our blog! Any questions or comments, just post below!